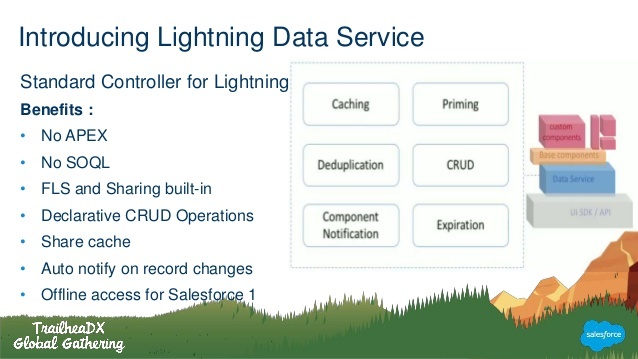 Salesforce has released the most awaited feature for Lightning Developers, Lightning Data Services – Standard Controller of Lightning Components! 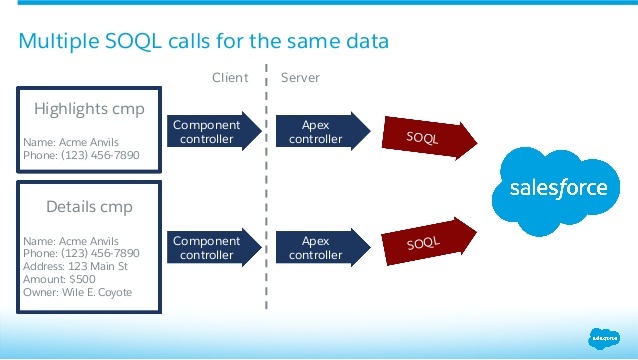 To speed up Lightning component development, Salesforce brought in Lightning Data Services. Lightning Data Service is a collection of lightning tags, methods, and events. We can relate it to Visualforce Standard Controller. At the simplest level, you can think of Lightning Data Service as the Lightning Components version of the Visualforce standard controller. Whenever possible, use Lightning Data Service to read and modify Salesforce data in your components. Lightning Data Service provides other benefits aside from the code. It’s built on highly efficient local storage that’s shared across all components that use it. Records loaded in Lightning Data Service are cached and shared across components. Lightning components does not enforce Field Level security while displaying data fetched from Apex controller, unlike Visualforce pages. So, it was required to check CRUD permission in apex controller. This can be skipped if you use Lightning Data Services. If there are many components on record detail page, then for each component there was SOQL to fetch data which affects the performance of the entire page. But if we use LDS it’s performance will improve as time lag to fetch data from server side will be saved. Also, prebuilt Lightning controller methods like Save(), getNewRecord() will help to perform DML in Lightning itself with writing any Apex. Data consistency – As the record values stored on client side in the cache, it will remain same across all the components. If you update value of any field in one component, it will be consistent on another component and it notify & refresh other components automatically. If you have a Lightning application that creates, reads, updates or deletes records, LDS is the best, most efficient way to do CRUD operations. LDS is here to simplify developer life. Adopting LDS means you no longer have to write your own controller code. All of your data access code is contained within the LDS component, significantly reducing the complexity of your apps and pages. This reduced complexity means that you don’t have to spend as much time on performance and quality testing. Loading a record is the simplest operation in Lightning Data Service. You can accomplish it entirely in the markup. To save a record using Lightning Data Service, call saveRecord on the force:recordData component, and pass in a callback function to be invoked after the save operation completes. To create a record using Lightning Data Service, declare force:recordData without assigning a recordId. Next, load a record template by calling the getNewRecord function on force:recordData. Finally, apply values to the new record, and save the record by calling the saveRecord function on force:recordData. To delete a record using Lightning Data Service, call deleteRecord on the force:recordData component, and pass in a callback function to be invoked after the delete operation completes. To perform tasks beyond rerendering the record when the record changes, handle the recordUpdated event. You can handle record loaded, updated, and deleted changes, applying different actions to each change type. To act when an error occurs, handle the recordUpdated event and handle the case where the changeType is “ERROR”. Lightning Data Service is powerful and simple to use. However, it’s not a complete replacement for writing your own data access code. Here are some considerations to keep in mind when using it. Here’s a longer, more detailed example of using Lightning Data Service to create a Quick Contact action panel. Represents the result of a Lightning Data Service operation that makes a persistent change to record data. Keep your eyes on an upcoming blog entry for more real-time examples to develop the Lightning Components using Lightning Data Service. Salesforce published Summer’17 release(Preview) notes. If You are a lightning lover like me then In this release, you can find lot’s of new features as well as new enhancements, for example, Field History Tracking, New Setup Tab, Keyboard Shortcut, Updated Activity Timeline, Classic Email template in Lightning. This is great news for all Lightning Lovers. Yes, finally you can track the history in Lightning. I posted this idea here Track and display the field history for standard or custom objects, regardless of which Salesforce interface you’re using. If you added the History related list to objects in Salesforce Classic, you can now see it in Lightning Experience. You can also set up a field history related list in Lightning Experiences. If you already added the History related list to your objects in Salesforce Classic, you’re all set. In Lightning Experience, look for your History related list (1) under the Related tab (2). When you enable Lightning Experience, it’s important to get your users working in—and benefiting from—the new interface. To help, the Switch Users to Lightning Experience tool now displays all users in your org so you can switch the exact group that you want in one go. The tool also makes it easier to find specific users on the list and to see which users in your org are eligible to switch. This change applies to both Lightning Experience and Salesforce Classic. The Switch Users to Lightning Experience tool is available from the Lightning Experience Migration Assistant in Setup. In the Migration Assistant, click the Set Up Users tab, then click Switch Users. Search the user list to find exactly the user you want (1). See at a glance which users have permission to access Lightning Experience and are eligible to switch (2), which users have already switched (3), and which users can’t be switched because they don’t have the Lightning Experience User permission (4).To switch users to Lightning Experience, click the button next to their names. Unlike before, you can’t use this tool to switch users back to Salesforce Classic. But users can switch themselves back as needed, using the Switcher in their profile menus. Ready to move from Salesforce Classic to Lightning Experience without looking back? Just hide the option to switch to Salesforce Classic from your Lightning Experience users so that they stay in Lightning Experience. This feature is new in both Lightning Experience and Salesforce Classic. By default, when you enable Lightning Experience, your users get the Switcher, allowing them to switch back and forth between Lightning Experience and Salesforce Classic. But if you want some or all of your users to stick to Lightning Experience, you can remove the Switcher (1) . In Setup, enable the Hide Option to Switch to Salesforce Classic permission (2) in profiles and permission set.When you enable the permission for your Lightning Experience users, new and existing users see Lightning Experience the next time they log into Salesforce. And, they no longer see the Switch to Salesforce Classic link. You can now use keyboard shortcuts to maximize your efficiency and speed while working in Lightning Experience. You can search for, edit, save, and close a record—all without touching a mouse. So start planning what you want to do with all the time you’re going to save! By default, keyboard shortcuts work in all Lightning apps. This change applies to Lightning Experience only. For Lighting apps with console navigation, extra shortcuts are available to help users navigate tabs, utilities, and more. To guide you through the optimal path to enabling Lightning Experience, we’ve given the Migration Assistant an easier-to-use, wizard-style interface. The tools for assessing and previewing your org’s readiness, setting up features and users, and flipping the switch are now visible at a glance—and faster to access. Oh, and it’s also easier to find the Migration Assistant in Setup. This change applies to both Lightning Experience and Salesforce Classic. The new Migration Assistant is a clean, concise wizard, with tabs that highlight the steps for transitioning to Lightning Experience. The interface focuses on specific tasks, one at a time. But you aren’t restricted to going through the tabs in a sequential order. As before, you can use the Migration Assistant to run tools like the Readiness Check and the Preview whenever and as often as needed. Simply click the desired tab to get down to business. When sales users convert leads, if the lead company name matches any of your accounts, it’s quick and easy to choose one of the matching accounts. This change applies to Lightning Experience only. Previously in Lightning Experience, if there was a single exact match between the lead company name and an existing account name, the account populated the Account Name field during lead conversion. New account matching brings Lightning Experience in line with Salesforce Classic. Support for person accounts—If the lead contains a company name, we search business accounts. If there is no company name, we search person accounts instead. Enhanced type ahead—Type-ahead search in the Account Name field now searches across all accounts rather than searching only the user’s recently used accounts. Multiple match—When a user clicks the Account Name field during lead conversion, a dropdown menu includes a list of all accounts that match the lead’s company name. If the lead does not have a company name, the list contains matching person accounts. Your marketing department can quickly target specific groups of leads, contacts, or person accounts by adding them to campaigns directly from standard and custom reports. This change applies to both Lightning Experience and Salesforce Classic. Reps can add up to 50,000 returned records to campaigns by clicking Add to Campaign (1). To let marketers add members to campaigns from custom reports, the report’s primary object must be Lead or Contact. The custom report type must also include the Full Name field.Previously, Salesforce Classic allowed members to be added to campaigns only from standard reports. The ability to add members to campaigns from custom report types is available in both Salesforce Classic and Lightning Experience. A path is now closed when the page loads, helping users view more record details without scrolling. You can configure how users display Path. This change applies to Lightning Experience only. To view or hide a path’s key fields and guidance, users click. To let your users decide whether a path’s guidance and key fields display automatically when the page loads, from Setup, enter Path Settings in the Quick Find box, then select Path Settings. Then enable Remember User’s Path Preferences. Review changes to an opportunity’s amount, probability, stage, and close date on the Stage History related list in Lightning Experience. This change applies to Lightning Experience only. Give your sales team a key tool for planning sales strategy. Use Lightning Contact Hierarchy to visualize the contacts on an account according to what sales reps enter in the Reports To field. Plus, customize contact hierarchy columns to show the information that’s most useful to your sales teams. This feature is new in Lightning Experience. Give your sales reps access to the hierarchy from contact pages. In Setup, in the Salesforce1 and Lightning Experience Actions section of your contact page layout, add the View Contact Hierarchy action. The Actions menu includes the View Contact Hierarchy action unless you customized the contact page layout before Summer ’17. The hierarchy shows who reports to whom according to the Reports To field. Sales reps can expand or collapse areas as they navigate. They can view up to 2,000 contacts from each point where they enter a hierarchy. To view contacts in a different part of the hierarchy, a sales rep can enter the hierarchy from a different contact. In Lightning Experience, reps can now email one or more quote PDFs by clicking Email PDF in the Quote PDFs related list or list view. This change applies to Lightning Experience only. The Lightning Sales Console app is now generally available. Plus, it also benefits from all the great improvements we’ve made to all Lightning console apps, such as person account support, split view navigation, and keyboard shortcuts. These changes apply to Lightning Experience only. Lightning Voice has a new name and more call list features. Sales reps can also send pre-recorded voicemail messages and dial numbers in reports and dashboards. These changes apply to Lightning Experience only. To create a call list, reps can select the people they want to call, and click Add to Call List. The prioritized list appears in the call panel. In addition to leads, call lists also support accounts, person accounts, and contacts. Reps can click Call Next to dial the number at the top of the list and open the related record. Only one call list is available at a time. Save time with custom voicemail messages. Reps can “drop” (or send) prerecorded messages to recipients’ voicemail boxes to focus their time on selling. This change applies to Lightning Experience only. To create a voicemail message, reps can select Voicemail Settings from the call panel or their personal settings. Leverage all the work and planning that went into your Salesforce Classic email templates by using the same templates in Lightning Experience. You can use your Text, Custom HTML, and Letterhead email templates in Lightning Experience. This change applies to Lightning Experience only. When you insert an email template, change the filter to Classic Templates. Quickly see what each activity is about with easily read summaries. Need the details? Click Expand to see more, without leaving the timeline. Want to drill deeper into your day? Click Expand All to see all the details on all the activities in your timeline. This change applies to Lightning Experience only. You can expand each activity individually, or expand and collapse the entire list of activities at once. Expanded emails are shown just like they were sent, with paragraphs and line breaks in the same place. You can take actions from within the email summary, too. The Assistant has a new look, and the performance chart now has both a weekly and daily view. These changes apply to Lightning Experience only. The Assistant has a slightly different look and feel. Click > to see more details about a specific update. This change applies to Lightning Experience only. Your sales reps can also quickly act on different updates with the new action buttons, such as sending an email or editing an opportunity. The performance chart displays opportunities for the current sales quarter that are closed or open with a probability over 70%. Sales reps can now switch between a weekly and daily view. This change applies to Lightning Experience only. Add, edit, or remove filters from your Lightning Experience dashboard directly from the lightning dashboard builder. Filters let people choose different views of a dashboard, so one dashboard does the job of many. Without dashboard filters, you’d have to create multiple dashboards, each with its own set of filtered reports. For example, add a filter on the industry field to track opportunities by industry. This feature is new in Lightning Experience. Folders are key to sharing and organizing reports and dashboards. Now you can create them in Lightning Experience. Switch to Salesforce Classic to grant other people access to folders. This feature is new in Lightning Experience. Salesforce published Winter’17 release(Preview) notes. If You are a lightning lover like me then In this release, you can find lot’s of new features as well as new enhancements for example updated navigation model, Merge Duplicate Leads, Quotes to Opportunities, Kanban view for Leads,Skype Call. With Winter17 Lightning Experience navigation make your users more efficient and allow them to switch between apps that you can brand and customize. If you know Salesforce Classic, the updated navigation model will feel like a familiar friend, only better. This feature is available in Lightning Experience only. Navigate at the Speed of Lightning! Think of the navigation bar as a container for a set of items and functionality. It’s always there, but the items within it change to represent the app you’re using. Similar to Salesforce Classic, apps in Lightning Experience (what we call Lightning apps) give your users access to sets of objects, tabs, and other items all in one convenient bundle in the navigation bar. However, Lightning apps take things to a level beyond apps in Salesforce Classic (let’s call those Classic apps). Lightning apps let you brand your apps with a custom color and logo. You can even include a utility bar and Lightning page tabs in your Lightning app. This is your go-to place for managing apps for Lightning Experience. It shows all your connected apps and Salesforce apps, both Classic and Lightning. Creating and editing a Lightning app is a cinch. Give your app a name, set its primary color, upload a logo, specify which items appear in the app’s navigation bar, and assign the app to user profiles. If your org includes utilities like Lightning Voice or Open CTI Softphone, you see options to add them to your app’s utility bar, which displays in the Lightning Experience footer. Yes, finally this is coming in Lightning 🙂 Salesforce Classic users have always appreciated the field-level help you create for your custom fields. Now your Lightning Experience users can love it, too! Previously, the help showed up only in Salesforce Classic. View help by hovering over the info icon next to a field. Field-level help in Lightning Experience is supported across all browsers. It shows up regardless of your screen size, the data type of the field, or the location of the field in your layout. Yes, “Save & New” action is now coming to Lightning. After your users create, edit, or clone a record in Lightning Experience, they can create another record using the Save & New button. The Save & New button lets users create records repeatedly without leaving their spot in the app. This feature is available in Lightning Experience only.The button is available in the same locations as in Salesforce Classic, which include most Create, Edit, and Clone pages. When your users create a record in Lightning Experience, the Create dialog title includes the record type if it exists. For example, you have two record types, Large and Small, assigned to the Account object to indicate account size. When your users create an account with the Large record type, “Large” appears in the title of the Create dialog to provide more context. This feature is available in Lightning Experience only. Wow, I am super excited for this 🙂 When your users expand or collapse a section in record details in Lightning Experience, the section stays that way even after visiting other areas in Salesforce. This change helps users scroll through a record faster, showing only the information they care about. This feature is available in Lightning Experience only. For example, in Lead details, a user collapses the Address Information section and expands the Additional Information section. The next time the user views a lead’s details with the same layout, those sections remain collapsed and expanded, respectively. As in Salesforce Classic, sections in Create, Edit, and Clone pages are always expanded. Confirmation messages that appear after your users create, edit, delete, or clone a record successfully from a related list in Lightning Experience and Salesforce1 have changed. The messages include the record name for more context. It will resolve the redirection issue to related records in Lightning. Also, after your users create a record from a related list in Lightning Experience (not Salesforce1), the popup message includes a link to the record for easy navigation. Here’s an example. When your users edit records inline and errors occur, the fields containing errors appear in a popup at the bottom for easy scanning. Fields are linked in the popup so that your users can navigate to them quickly to fix. This feature is available in Lightning Experience only. As in previous releases, field error descriptions also display under the field. To create a Lightning component action, select Lightning Component from the Action Type drop-down list when you create either a global or object-specific action. Lightning component actions can’t call just any Lightning component in your org. For a component to work as a Lightning component action, it has to be configured specifically for that purpose and implement either the force:LightningQuickActionorforce:LightningQuickActionWithoutHeader interfaces. After reading an email, you often want to respond right away. Now you can. Just click Reply, Reply All, or Forward from the email detail page or activity timeline. It’s as easy as…sending an email. These options are only available to organizations using Enhanced Email, which is automatically enabled for most customers. This feature is available in Lightning Experience only. Getting rid of duplicate lead records prevents multiple reps from contacting the same lead. We’ve made it easier to improve data quality. Give your sales reps the ability to resolve duplicate lead records as they find them. 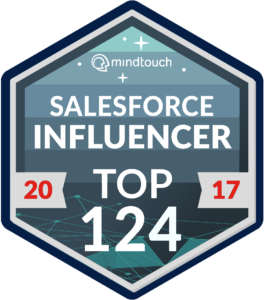 Salesforce identifies key field differences across multiple records and lets a rep merge the best information from the top three records. This feature is available in both Lightning Experience and Salesforce Classic. Add products with revenue or quantity schedules to opportunities anywhere, any time. When your reps add a product with an established revenue or quantity schedule, the established schedule is added to the opportunity line item. This feature is available in Lightning Experience and all versions of the Salesforce1 mobile app. Switch back to Salesforce Classic to enable product schedules, or to establish or modify schedules for products. Opportunity owners can now manually edit the Probability field without switching to Salesforce Classic. This feature is available in Lightning Experience, Salesforce Classic, and all versions of the Salesforce1 mobile app. Now you can take advantage of quotes in Lightning Experience to show customers the prices of the products and services that your company offers. Sales reps can create and edit quotes and quote line items, add quotes to opportunities, and save quotes as PDFs. This feature is available in both Lightning Experience and Salesforce Classic. Your sales reps can keep everyone in the org up to date on the latest news by sharing news articles on Chatter. This feature is available in Lightning Experience and all versions of the Salesforce1 mobile app. The News feature, which includes timely, relevant news from US sources, is available for accounts, contacts, leads, opportunities, and on the Home page. When reps come across an article that may be of interest to others, they can click the share icon ( ) to share it with other people or post it to the related record’s Chatter feed. When a rep shares a news article from a record’s detail page, it’s posted to that record’s Chatter feed. The rep can also @mention individual users or groups. When a rep shares a news article from Home or the News app, the article is posted to the rep’s own Chatter profile for all the rep’s followers to see. The Import My Accounts and Contacts wizard is now unavailable. Remind your users to upload their data using the Data Import Wizard instead. For more information, see “Import My Accounts and Contacts Retirement in Winter ‘17.” This change affects both Lightning Experience and Salesforce Classic. The Assistant features more relevant, actionable updates. Your sales reps can act directly on different recommendations, including sending an email or creating a task or event. Sales reps can also dismiss recommendations that aren’t relevant. To give your sales reps more bang for their buck, we’ve added relevant actions to recommendations. For example, if a sales rep receives an update that an opportunity doesn’t have any open activity, the rep can create a task or event directly from the recommendation. Your sales reps can easily dismiss recommendations that aren’t relevant. This feature is available in Lightning Experience only. Click to dismiss a recommendation. After all the available cards are removed, the Assistant refreshes and checks for more available recommendations. Salesforce added a ton of new features to Voice, including new ways to make calls and call forwarding. Beginning with the Winter ’17 release, Lightning Voice is available only through the utility bar, so an additional task is required to continue using this feature. This feature is available in Lightning Experience only. To continue using Lightning Voice, admins must use the App Manager to make the feature available from the utility bar at the bottom of the page. The utility bar gives your sales reps quick access to commonly used tools. This feature is available in Lightning Experience only. Your sales reps no longer need to have a phone number associated with a record to place a Voice call. They can use the keyboard or the virtual dial pad to enter phone numbers or extensions. This feature is available in Lightning Experience only. No need to worry about missed calls! Sales reps are now notified about them. They can also forward calls to their mobile number to guarantee that they never miss that big sales call. This feature is available in Lightning Experience only.Missed call alerts appear in the Notifications drop-down. Your reps breeze through record updates in Lightning Experience with Lightning Edit in list views. Reps can modify a record without opening it, right from the list view. Even better, they can save multiple records at once. This feature is available in both Lightning Experience and Salesforce Classic. If you use queues to prioritize and assign leads among team members, your reps can now take ownership of multiple leads from the queue at once. This feature is available in both Lightning Experience and Salesforce Classic. Sales reps can more effectively monitor their progress with leads, contracts, and campaigns using the same Kanban-style visual layout they use for their opportunities. This feature is available in Lightning Experience only. Everybody hates a detour. Great news: Now your reps can edit or delete records from the Kanban view. This feature is available in Lightning Experience only. Required fields aren’t blockers anymore. Now reps can fill in fields required to move a record to a different stage or status from within the Kanban view. Skype for Salesforce integrates Salesforce and Skype for Business, allowing you to chat with and make audio and video calls to other users in your org. Skype for Salesforce is available only if your business has a Skype for Business online license. This feature is available in Lightning Experience only. Once you’ve enabled Skype for Salesforce for your users, they see a banner prompting them to log in to Skype for Business. Users who have logged in to Skype for Business can hover over the names of other users in your org to see if they are online and contact them with Skype audio and video chat. You know that report you check when you arrive in the office every Monday morning? Why not have it emailed to you every Monday at 8:00 AM instead? Subscribe to up to five reports and receive refreshed report results by email on a schedule you set: daily, weekly, or monthly. To start a report subscription, open a report and click Subscribe. Specify when to receive the report, and then go about your business. When you need the report data, it’s waiting for you in your inbox. From the Lightning Experience dashboard editor, you can now add table components and sort columns from the component editor. Tables in Lightning Experience dashboards show conditional highlighting and Chatter photos, but to configure conditional highlighting and Chatter photos, switch to Salesforce Classic. Gauge charts added to Lightning Experience dashboards now show percentages by default. Gauge charts configured to show percentages in Salesforce Classic now also show the percentage in Lightning Experience. Stacked bar charts are wonderful for comparing absolute values side by side. Stacking a bar chart to 100% enables you to compare relative values side by side. For example, instead of comparing opportunities by stage and total opportunity amount, stacking lets you compare the proportion of opportunity amounts by stage. To stack a bar chart to 100%, your report must have at least two groupings, and one of the groupings must be a number.